To be successful in integrating social media into your fundraising channels, you need to use different techniques, tactics and tools to map to the person’s level of interest. You need a portfolio of approaches or maybe even campaigns that meet people where they are at and help get them more engaged with your cause and organization. 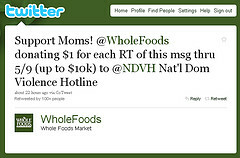 The Whole Foods sponsored retweet donations is focused on a lower level of engagement, simply spreading the message. This type of campaign is a win-win for sponsors and for nonprofits that need to boost awareness of their issue and have just started dipping toes into the social media waters. What is missing is some mechanism for the nonprofit to reconnect with those who are retweeting the message and engage and educate them, perhaps getting them to the point of making a donation, volunteering or signing up for a newsletter. My colleague, Geoff Livingston, recently wrote an analysis on Mashable about Twitter’s new social good initiative Hope 140. The first effort was the #EndMalaria campaign that used the TwitPay platform for donations, creating a combined call to action that asked Twitter users to retweet by donating $10. The Case Foundation matched donations with a $25,000 grant. The effort raised over $11,000. Another example of this combined called to action comes from Epic Change and its “To Mama With Love.” Their call to action focuses on donating and user-generated content. What I think has made this campaign catch on is that it is powered by love or an emotion we feel for our mothers or being a mother. Also, Tweetsgiving has been building and cultivating a network and has now has a cadre of people who are engaging in a deep way by encouraging peers to participate. Work to get more people engaged as you strive to gently nudge them further up the rungs of your ladder. It is important to understand that these levels of engagement are part of an ecosystem. While fewer people may reach the very highest levels of engagement because of the time commitment, personal connection or interest, those with lower engagement are important to the ecosystem because they spread awareness. Recognize and appreciate people where they’re at, and work to get more people engaged as you strive to gently nudge them further up the rungs of your ladder. This takes a combination of tactics and approaches – from one-on-one relationship building to more broadly spreading your message. You need also take into account where you are in developing your network at all times. You should be nurturing those higher levels of engagement outside of campaign mode. You also need metrics and measurement to see what works in terms of moving people up the rungs! What is your repertoire of engagement techniques to inspire people to move up the ladder? Are you thinking about it one campaign at a time or as an ongoing activity that includes campaigns? How do you balance your social media strategy so it includes both low and high levels of engagement? Beth Kanter is CEO of Zoetica, a consultancy for nonprofits. See her profile, visit her blog, contact Beth or leave a comment. I'm trying to be looking for ed hardy swimwearside, who can help me see, how about this? Whay are you don’t publish actual news?